Bring your blanket and chair for a front row seat in Woldenberg Park for the 9pm fireworks show. 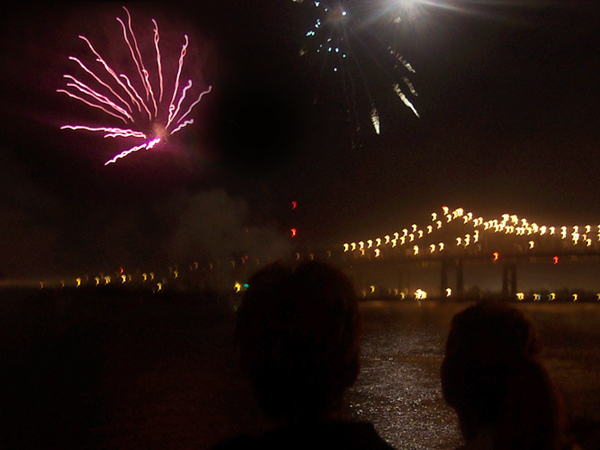 Also, bring your radio for this passionate salute to America’s independence, which will feature the one-of-a-kind dueling barges fireworks display along the New Orleans Riverfront. Simulcast on Magic 101.9 and WWL AM, FM, and .com and heard in 38 states! Check out the new choreographed app, which will let you listen to the music. The app can be downloaded by going to www.jandmdisplays.com/app.html or by scanning the QR code on the website, www.Go4thontheRiver.com. For the 9:00pm. Dueling Barges Fireworks Show over the Mississippi River in the French Quarter. This patriotic tribute is one unique to New Orleans. Get $4 off a single adult or child admission ticket at Audubon Aquarium of the Americas and Audubon Butterfly Garden and Insectarium! Visit Go4thOnTheRiver.com to get your coupon and see what's going on all day.